Abro este hilo para que recomendemos wargames que jugar mientras vamos en el metro, autobús o esperamos con el teléfono móvil. ¿Que más wargames para móvil interesantes conocéis? Podrás contar con comandantes mucho mejores que yo, pero no encontrarás mejor suboficial. No funciona en todos los dispositivos, de momento. Sería más bien para tablets pq requiere java. Por cierto, no lo he podido probar aún, si alguien lo hace, que comente que tal está. El battle of bulge sin duda es de lo mejorcito. De hecho la versión de Steam es posterior. Instalado, pinta muy bien en las capturas! No hay que tenerle miedo a ningún juego! Si pierdes una o dos partidas... En la siguiente serás más fuerte! Refloto este post porque no puedo creer que no nadie haya colocado los juegos de Conflict Series que creo Joni Nuutinen. Son geniales, tienen profundida estrategica, en algunos tiene nivel tactico, de batallones, regimientos y en otros de divisiones. La IA es buena y la rejugabilidad es grande. Para cuando estas en el transporte y lejos de la PC, son de lo mejor. Tengo ya varios y han sido muy satisfactorias, las victorias. El desarrollador continua realizando actualizaciones para cada juego, es muy activo. Link de la google play, desafortunadamente no esta para los que tienen productos apple. In this classic Winter War campaign you are leading the Finnish forces which must outmaneuver two waves of Red Army attacks, which are trying to cut Finland in two at its narrowest point. Massive Soviet attack on two isthmuses aims to knock Finland out of the World War II. Can you stop the advance of the Red Army, regroup, and launch counterattack to save Finland. Axis Balkan Campaign takes place on in Yugoslavia and Greece in 1941. Germany, preparing for Operation Barbarossa, needs to bail out struggling Italian forces and secure problematic southern sector in the rear area of the Eastern Front so that the Western Allies cannot threaten Romanian oilfields or launch a counterattack from Greece. In the middle of planning for the Greek operation, a coup in Yugoslavia removes them from the Axis Powers, delivering a blow to the prestige of Germany. As a result, Operation 25 (invasion of Yugoslavia) and Operation Marita (invasion of Greece) must be carried out in quadruple hurry. One of the most classic strategy game scenarios of all time: German attack on the Soviet Union in 1941. The quick and easy early victories soon turned into endless grinding against the flood of Red Army divisions and the notorious Russian weather. Operation Barbarossa on a larger scale (bigger map, more units, partisan activity, railway movement, generals, etc) and with more control over production and railway network building. German attack into the Poland in 1939, also known as Fall Weiss (Case White), was the first real test of Blitzkrieg. Thanks to being able to attack Poland from multiple directions Germans were able to overcome heroic Polish defense fairly quickly, but the offensive nonetheless started the Second World War, as France and England declared war on Germany. The against-all-odds German plan to invade the United Kingdom in the Fall of 1940. The whole campaign relied on the highly unlikely possibility of being able to ferry supplies across the English Channel long enough to finish the undertaking before, inevitably, RAF and Royal Navy grinded the German supply route into pieces. In spring 1942 Wehrmacht was preparing to launch Case Blue, the strategic German summer offensive on the Eastern Front. The plan outlined advance to Stalingrad and then the main force would turn south and drive to Caucasus to seize the crucial oil fields of Maykop, Gorzny, and Baku. Modelling the northern third of Operation Barbarossa with logistics of fuel supply. You are in command of the German Army Group North, tasked with striking through the Baltic states all the way to Leningrad, the cradle of Bolshevism. It is essential for German Panzer Corps to seize Leningrad quickly, before the offensive is inevitably slowed down by the steady flow of Red Army reinforcements, worsening weather, challenges of fuel delivery on ever expanding area, and terrain filled with forests and swamps. After destroying the German 6th Army in Stalingrad, the Soviet high command hopes to end the WWII in one decisive strike through the Axis lines towards Dnetropetvosk via Kharkov to cut off 1 million Germans on the southern part of the Eastern Front. Panicking German Generals try to find men to throw in front of the Soviet offensive. However, in a masterclass of strategy known as Backhand Blow, Erich von Manstein removes all Panzer divisions from the battleground and wishes the Red Army 'bon voyage'. While Stalin keeps phoning the Soviet commanders about the looming encirclement of epic proportions, Manstein is gathering Panzer groups on both flanks. When unleashed, they cut off the Soviet armies, retake Kharkov, and turn the situation upside down. Can you stabilize the crumbling front line after Soviet attack encircles the 6th Army, and hold on long enough to eventually launch a counterattack to free the out of supply units and turn the dangerous situation around. A group of German formations are encircled deep behind the Soviet front line in Demyansk. Can you both open up and keep open a corridor to the encircled troops, while holding the city of Demyansk. In 1943 Germans grouped most of their elite divisions into two spearheads to capture the Kursk salient in a plan called Operation Citadel. However, thanks Allied code breaking efforts the Red Army immediately knew German plans in detail and prepared multiple defensive lines in addition of gathering massive reserves for counterstrikes. During the operation the battle around Prokhorovka evolved into one of the largest armored clashes in military history. Live through the German push to seize the Capital of the Soviet Union, an extremely critical railway junction, before the winter closes in. Horrible weather, countless rivers, multiple defense lines, and the stubborn resistance by the Red Army, which received reinforcements of both quality (Siberians and T-34 tanks) and quantity (numerous local defense divisions), eventually ate up the German ability to advance any further. Hold the central Berlin as long as possible against the overwhelmingly massive concentration of Red Army divisions which want to be the first Allied troops in the capital of the Third Reich. Meanwhile, as the end nears German infrastructure is slowly crumbling down, making effective defense harder and harder. Tackle increasingly difficult tasks somewhere on the WWII Russian Front. Small map size keeps the missions at nicely short, while having to manually delivery fuel from Depots to Panzer units and ammo from Depots to artillery requires ability to think ahead to avoid being out of fuel just before reaching the Objectives of the mission. Germans make handful of landings in Norway (Operation Weserubung) to quickly seize the country before the Allied landings take place. The northernmost landing in Narvik almost turned out to be a bridge too far for Germans who had to throw in all their skills just to survive until reinforcements arrived. Can you handle the mammoth undertaking of dealing with five different landing zones while Royal Navy strikes your convoys threatening to collapse the whole invasion. In this fine model of a German Blitzkrieg attack (in which Panzer Divisions focused on narrow sector), Wehrmacht pushed a wedge through Allied front line and captured the coastal cities, splitting the Allies in two and forcing France out of the war. Can you make do with the meager Axis fuel resources, long supply lines, and unreliable Italian partners and successfully push the British forces away from North Africa. The classic campaign about the slower than anticipated Allied breakout from D-Day landing beaches to the wider Normandy area in 1944. While German struggled to approach the actual beach area because of overwhelming Allied firepower both from air and sea, and the huge number of Allied units on the beaches, Germans managed to essentially contain the Allied advance for months. Do you have what it takes to actually push the Allies back into the sea and take back the control of those landing beaches? German side of the D-Day: Can you push the Allied armies, which are constantly getting reinforcements and supported by air superiority, back to the sea and secure the Third Reich. Commanding American forces you must survive the massive initial German onslaught to launch a successful counterattack from the flanks with reinforcements to cut off and destroy the last big German offensive in the Second World War. The Allies, feeling that the war is won already, are taking it easy: Eisenhower and Bradley are at a party, Montgomery is golfing. Meanwhile, Wehrmacht unleashes a huge surprise attack against a quiet American front hoping to drive towards Antwerp and to split the Allies in two. The risky Allied attempt to use several separate drops of airborne troops to suddenly create a 100-km corridor, including handful of bridges, across German held territory to open up a route to the German industrial heartland. German attack on Crete was the first mainly airborne invasion in the military history: Elite German paratroopers jumped into chaos of several landing zones, only to discover much stronger than expected Allied forces squeezing them from all the directions. To have any chance of success Germans needed to seize the key airfields during the first few days to flow in replacements and resources. The first step of knocking Italy out of the Axis powers was the invasion of Sicily in 1943. Campaign soon developed into competition between the US and the UK forces, allowing most of the German forces to evacuate to the Italian mainland. The campaign which was thought to be easy, turned out to be bloody grinding in the difficult Italian terrain filled with multiple defensive fortification lines and mountains which heavily favored the defender. To quickly captured Rome, all the Allies needed to do was to push through the Gustav Line and link up with the Allied forces landed in the Anzio beachhead behind the German lines. Will you play it safe in the Anzio beachhead and wait for the main force, or try to expand so much that the main German might be cut off? The armed forces of the Nationalistic Faction, after its semi-failed coup, is in control of two separate areas inside Spain, while the most soldiers and the biggest cities of Madrid and Barcelona stay loyal to the left-leaning Republican side. 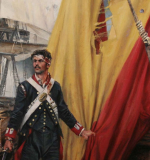 Can you navigate the chaotic setup of your forces (from weak Militia to battle-hardened Army of Africa) to consolidate enough area under your control to entice more support from abroad to continue the struggle for the full control of Spain? It is a rollercoaster of a campaign as at first North Korean troops seize almost the entire Korean Peninsula, before the US-lad UN forces arrive at the last moment to reverse the fortunes - only to face a massive Chinese counterattack just before the Peninsula is secured. Can you withstand the back and forth hammer blows to eventually crush the Communist forces to unify Korea as one. Can Confederacy survive the war years of 1861-1865, or even win, in spite of the superior industry and manpower of the Union? In a SUPPLY mode units can only attack when they have ammo depots nearby, forcing players to think ahead before launching major offensives. Crush the British, Royalists, and Indian raiders to win the independence for the United States. Will you win by focusing on building a huge army or evacuation key resources to safety and building proper infrastructure like roads to win with a smaller force. This scenario covers Operation Olympic (landing on Kyushu), which was the first part of Operation Downfall (Invasion of Japan). The geography of Japan has forced the Allies to choose a predictable strategy, and the Japanese have set up their fanatical forces very well to take on the American onslaught. To defend Kyushu Japan is planning to throw in most of their troops, as well as what's left of their naval might. The fact that Japan is starting to run low on supplies is counterbalanced by the extreme supply distances Allies has to deal with, not forgetting kamikaze planes and midget submarines. American troops continue their Pacific island hopping campaign with Operation Forager - Capture of Saipan. You are in command of the American Army and Marine forces, tasked with seizing the control of the island from which Japanese home island would be within the range of the new Boeing B-29 Superfortress long-range bomber. League of Nations gave Japan a mandate to rule Saipan after the First World War, and the huge Japanese population meant the island was considered to be part of Japan proper. The ensuing battle saw both the largest Japanese tank battle and the biggest banzai attack of the Pacific war. When withdrawing from Philippines in 1942 General Douglas MacArthur made a promise: The US would be back! In October 1944 American forces made a bold amphibious landing on the island of Leyte, surprising the Japanese defenders who were expecting a safe landing on one of the southernmost islands. The surprising timing and location guaranteed U.S. forces easy first weeks. However, Japanese HQ made the decision to settle the fate of Philippines on the Leyte and transported lot of reinforcements from the nearby islands to Leyte. The combat on Leyte escalated into massive battle requiring U.S. to commit all their reserves to stay true to their promise. Guadalcanal, an inhospitable island located in the Solomon Islands in the Pacific, had never interested anybody... Until in the summer of 1942 Japanese decided to use the island to build an airfield to advance their push towards Australia. This forced the U.S. to send in the Marines and some destroyers to seize the airfield - to which Japanese reacted by sending troops and more naval power in the area - to which Americans reacted by sending more reinforcements and warships - to which Japanese reacted by sending more warships and troop transports... Soon two of the biggest empires in the world were engaged in a cut-throat battle both on land and on water for the control of this godforsaken island. In February 1945, the American Marine force planned to seize the small island of Iwo Jima from the Imperial Japanese Army, hoping the operation would last only couple of days, but the ensuing 5-week battle saw some of the fiercest and bloodiest fighting of the Pacific War of World War II. The American attack on Okinawa was the largest amphibious assault in the Pacific War during World War II. After a long campaign of island hopping, the U.S. was planning to use Okinawa as a base for air operations for the planned invasion of the Japanese home islands. The battle is infamous for the ferocity of the fighting and the intensity of Japanese kamikaze attacks. Lead German forces into quick victory - or failing that get stuck in the mud, trenches, and Allied forts. Control the production and railway networks to suite your particular strategy and tactics. Recent hand-picked WWII-related headlines and links to the actual articles. Última edición por marko el Jue Abr 26, 2018 3:39 pm, editado 1 vez en total. Tienes razón, no esta, juraba que los habia visto ahí también y mirando el FAQ de la pagina, indica que no cree posible que lo pase a IOS debido a la cantidad de apps que ya tiene y que requeriria realizar nueva programación para apple (imaginaba que el traslado de android a apple y visceversa era más directo, pero según veo es más complejo de lo que esperaba). Una lástima que no esté para iOS por que tiene buena pinta.